The first ship in the class, Al Shamikh, was launched in July 2009. Al Rahmani was named and launched in July 2010. The final ship Al Rasikh was launched in June 2011. Khareef Class is equipped with Thales Vigile 400 ESM (electronic support measures) system. The Khareef Class corvettes are being built by BAE Systems for the Royal Navy of Oman (RNO) under Project Khareef. Equipped with anti-air and anti-surface capabilities, Khareef Class can defend from both surface and air threats while protecting the international waters and Oman’s exclusive economic zone (EEZ). The corvettes are used in extended surveillance patrols, deterrent operations, search and rescue missions, joint and coalition operations as well as disaster relief roles. In January 2007, the RNO placed a £400m ($650m) order for the design and construction of three corvettes. The contract also includes the training of RNO crew and initial logistics support for the vessels. The first ship in the class, Al Shamikh, was launched in July 2009 and delivered to the RNO in June 2013. Al Rahmani, the second ship, was named and launched in July 2010, and delivered to the RNO in October 2013. 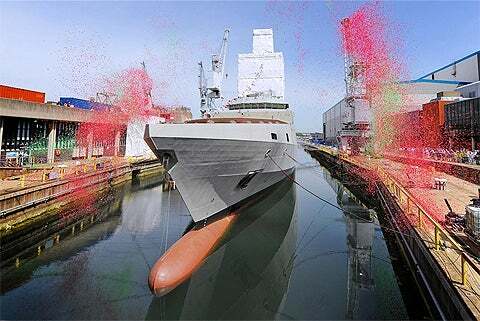 The final ship Al Rasikh was launched in June 2011 and delivered to the RNO by May 2014. The modular design supported by a comprehensive weapons management system allows customers to integrate equipment and systems for specific mission requirements. The hull is incorporated with stealthy features for reduced radar signature. The vessel was designed to operate in high seas for a longer time period. The corvette has a length of 99m, a beam of 14.6m and a draft of 4.1m. Displacement of the ship is 2,660t. The vessel can complement a crew of 100 people. "In January 2007, the RNO placed a £400m ($650m) order for the design and construction of three corvettes." The command and control of the corvette is based on the TACTICOS combat management system (CMS). Thales Nederland was contracted to supply radar, the electronic support measure (ESM) system, combat management and communication equipment for three vessels in September 2007. Using the commercial off-the-shelf (COTS) hardware and operating systems, the TACTICOS CMS provides surveillance and picture compilation based on the information obtained from the on-board sensors and tactical data links. The system supports the anti-air, anti-surface, anti-submarine and electronic warfare by providing threat evaluation, sensor and weapon assignment, and kill assessment. The Sting electro-optic director from Thales Nederland provides weapons control. The Khareef Class is armed with MM40 Exocet Block 3 surface-to-surface missiles and vertically launched Mica surface-to-air missile system supplied by MBDA. The MM40 Block 3 can engage targets within a range of 180km. The main gun fitted forward is an Oto Melara 76/62mm super rapid gun. The gun has a rate of fire of 120 rounds a minute. The corvettes are also armed with two MSI DS30M 30mm guns. The SMART-S Mk2 3D multibeam radar operating in S-band provides medium-to-long-range surveillance and target designation. It acts as a main air and surface search radar in the single radar concept implemented for a range of naval ships including light frigates, corvettes and landing platform docks (LPD). "The command and control of the corvette is based on the TACTICOS combat management system (CMS)." The system can be fully integrated into the onboard combat management system. The soft-kill defence is provided by Rheinmetall multi-ammunition soft-kill system (MASS). The system can lure incoming modern sensor-guided missiles by firing decoy rounds. The corvette has a flight deck to support the operations of a medium sized aircraft. The helideck can accommodate a helicopter with a maximum weight of 12t. The ship is equipped with hangar and maintenance facilities for the embarked helicopter. Khareef Class is powered by two MTU diesel engines. Designed to deliver fuel efficiency and low whole life costs, the propulsion system provides a maximum speed of 25kts, a range of 4,500m and an endurance of 21 days. Rolls-Royce was contracted to supply controllable pitch propellers, gensets, electric equipment and steering gear for three ships. The Khareef Class corvettes are equipped with high-quality accommodation and recreational facilities for crew members. The ship has dedicated areas for each officer and rating. Joint force command staff are provided with additional living areas. This project forms part of our recent analysis and forecasts of the global naval surface combatants and warfare systemsmarket available from our business information platform Strategic Defence Intelligence. For more information click here or contact us: EMEA: +44 20 7936 6783; Americas: +1 415 439 4914; Asia Pacific: +61 2 9947 9709 or via email. Two Kasturi Class corvettes are in service with the Royal Malaysian Navy.